We had joined the kids for dinner a few nights ago, and as luck would have it, we decided to enjoy dinner out. Once the decision was made to eat out, next we had to decide where. Quickly we all found agreeing on Mexican food. 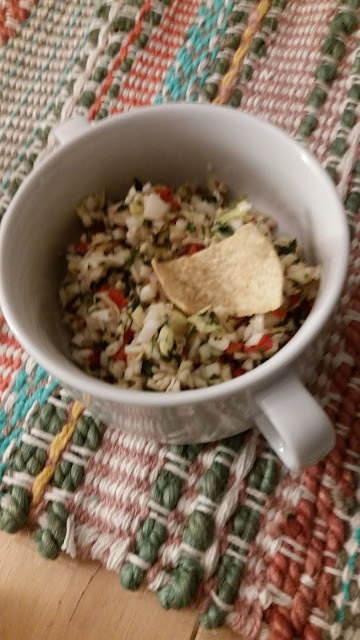 Once there we were given the usual basket of chips and a bowl of salsa, except this, was not the usual tomato salsa, this was a delicious chopped cabbage salsa. Once I tasted it, I am pretty sure I ate more than my fair share, but fortunately another bowl was delivered before we could even ask! Now the quest was on, how could I make this myself, at home? I love the internet for times like this, a few key taps and I had a plethora of cabbage salsa recipes to look through. Now seemed exactly like the restaurant salsa, but that did not get in the way of giving it a try. And I must say, while not exact, it is very tasty. I will be making this again because there is always a reason to enjoy crunchy chips with salsa. Combine well, let sit at room temperature to mellow and allow the flavors to marry. One to two hours is fine. Serve at room temperature with crispy tortilla chips. * You may use more of this ingredient if desired. Hi Pam, thanks for stopping by! I think you will like this, it is perfect for when you have a cook out and friends over. PS, I am glad you are back to blogging!! How unusual. With the ingredients given I can't even imagine how that tastes. But I do know, with that ingredient list, my husband would love it. I think I'll make him some. It is so good with the salty chips! I hope you enjoy it as much as we did.